You are at:Home»India»Ladakh, Zanskar & Kashmir»Ladakh»How to get Ladakh Inner Line Permits Online? How to get Ladakh Inner Line Permits Online? Starting June 2017, Ladakh Inner Line Permits are available online from the official website of Leh Ladakh administration. It is a very welcoming news for all the people planning their trip to Leh Ladakh. 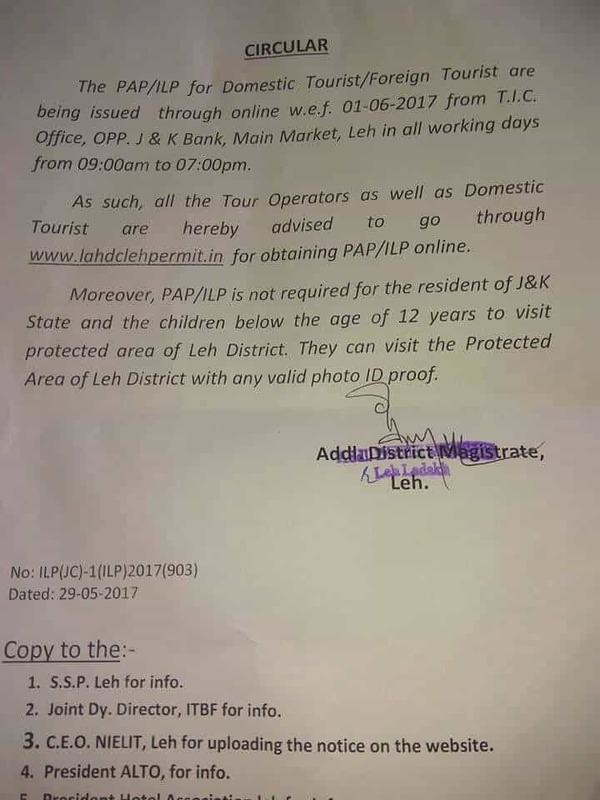 This will help all those tourists who travel to Ladakh during holidays and used to find Leh DC office closed during those days for getting the permits to travel to tourist spots. Now, tourists can apply for the Leh Ladakh permits online, choose a tour operator to pay the fee and get their copies of the Ladakh to permit online. This has eased out the process and eliminate the hassles to procure these permit in advance. Leh Ladakh Inner Line Permits are available online for both domestic tourists as well as foreigners. Do I need any permits in Ladakh? Back in 2014, the concept of Inner Line Permits for domestic Indian tourists was waived. This meant all Indians traveling to Inner Line region of Ladakh including Nubra Valley, Pangong Tso, and Tso Moriri were exempted from the need of inner line permits. Domestic tourist just required a self-declaration form when visiting these places and that will act as the permit for them. The decision was reverted back in 2017 to the original requirements of having permits. In April 2017, authorities in Leh Ladakh reverted the decision and re-introduced the Environment Fee of Rs 300, Red Cross Fund fee of Rs 100 and Inner Line Permits for domestic tourists as well. 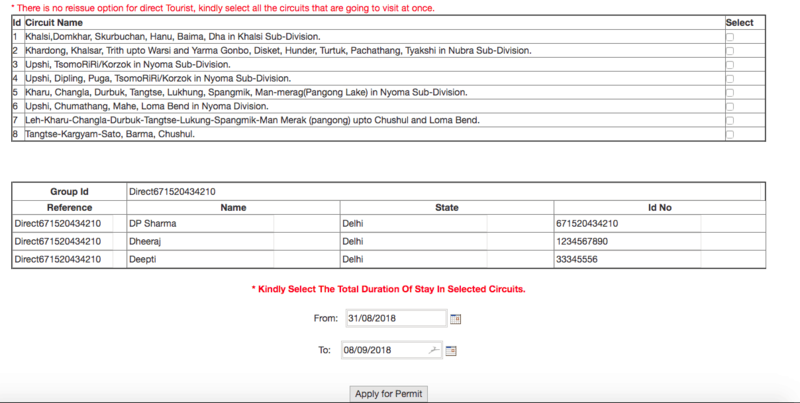 No all tourists, foreigners and Indians, visiting the Inner Line region of Leh Ladakh need these permits to visit Nubra Valley, Pangong Tso, and Tso Moriri. Foreigners need a Protected Area Permit to visit tourist places in Ladakh which is different from Inner Line Permits needed by domestic tourists. In this article, let’s look at the step by step process to obtain Ladakh Inner Line permits online or in advance of your Ladakh trip. This will help you a lot in planning the trip to Ladakh smoothly. I will also discuss in detail the manual steps required to apply for the inner line permits. Ladakh Inner Line Permits (ILP) are required for Indian Tourists and Ladakh Protected Area Permits (PAP) are required for foreigners. These permits are required in Ladakh in order to visit the inner line places like Nubra Valley, Khardung La, Pangong Tso, Tso Moriri, Dah, Hanu Villages, Man, Merak, Nyoma, Loma Bend, Turtuk, Tyakshi, Chusul, Hanle, Digger La, Tangyar (for trekking only). You do not need any permits for traveling on Manali Leh Highway or Srinagar Leh Highway or Zanskar Valley. The permits for Hanle and direct route from Pangong Tso to Tso Moriri from Chusul can only be applied manually or in person at Leh DC office. These permits are not required for residents of J&K state and children below the age of 12 years. They can visit the inner line region in Ladakh by showing/carrying a valid Photo Id proof. Both Protected Area Permits (PAP) and Inner Line Permits (ILP) are available online from the official website www.lahdclehpermit.in of Leh administration. 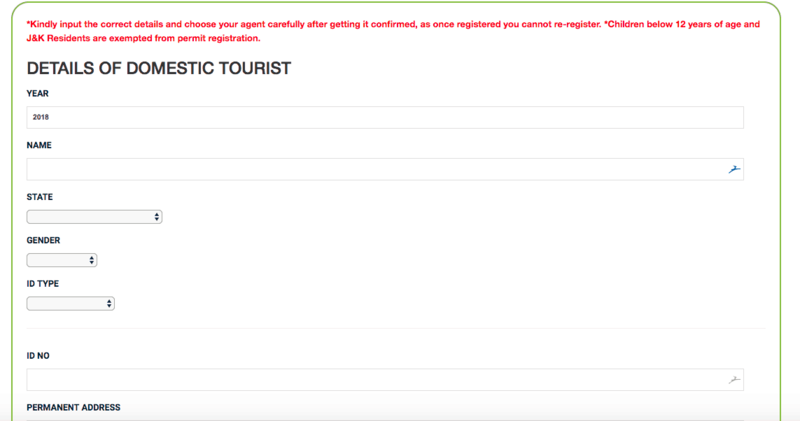 All tourists can go through the website to obtain the inner line permits. You need to pay an Environment fee of Rs 300, Red Cross Fund fee of Rs 100 and inner line permit fee of Rs 20 per day per person to get these permits. You need to provide a valid photo ID proof to apply for these Inner Line Permits in Ladakh. You can pay the fee for the Inner Line Permits when you choose the option of the tour operator and pay them the required fee after applying for the permit. Click on the “Apply for Permits -> Domestic Clients” button on the center bottom of the screen. It will take you to the first step of providing the details of Domestic Tourist applying for the permits. On this page, you need to enter your details including Name, State, Gender, Id Type, Id Number and Home Address. Apart from that, you need to choose if you are applying directly or through an agent. You should choose to apply directly because with agent option you have to get in touch with the agent to get your permit processed. Lastly, you need to enter the Arrival Date when you are arriving in Leh and start exploring inner line areas of Ladakh. Then, you click on Submit. When you click on submit, it will take you to the screen with two options “Click here to issue individual permit” and “Click here to issue group permit”. If you are applying for the permit alone, you need to click on Individual permit option else if you are in a group, choose the group option and add details of other users on the next screen. Once, choose the respective option (and fill group details in case of group option), you will be taken to the next screen where you need to select among the circuits which you plan to visit in Ladakh and a reference number will be present on the page. PLEASE NOTE the reference number and save it somewhere as it will be required to Print the permit whenever you need it. 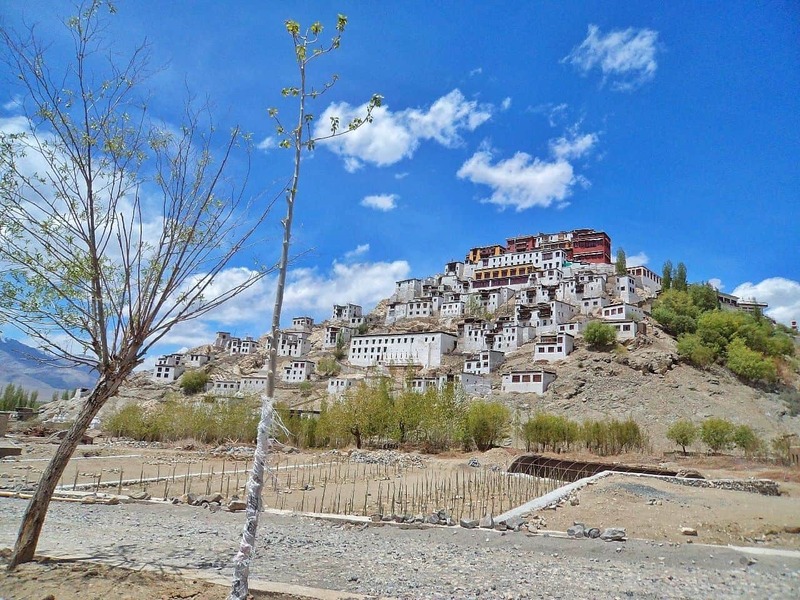 Select the required circuits as per your itinerary of Ladakh trip. As you cannot reissue the permits, so choose all the circuits at once when applying for the permits. 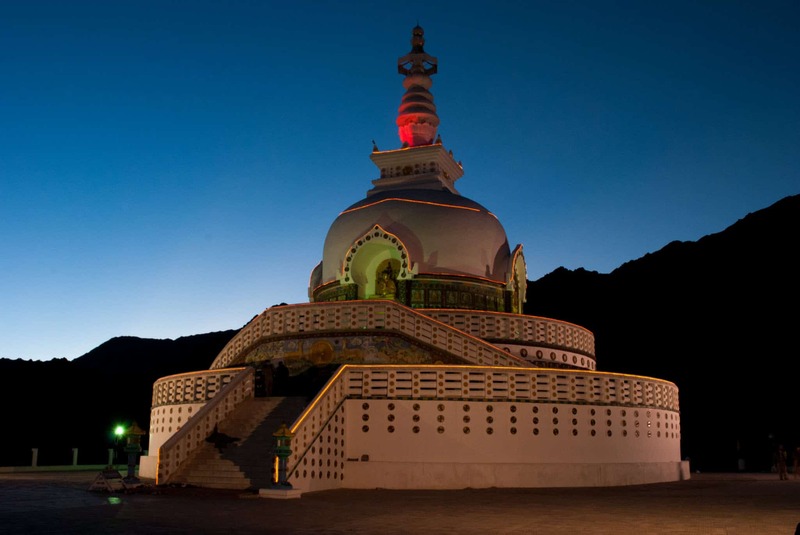 Below table will help you select the relevant circuits based on your Leh Ladakh trip plan. Finally, enter the Start Date and End date of the permit which will define the total fee for your permits. Click on Apply for Permits button which will take you to the confirmation page that tells you about the selected circuit details with dates of the permits. You need to click on the Proceed button to generate your permit. Print few copies of this permit. Download the sample online permit for reference purposes only. You can choose to click on Pay Now option to pay the permit fee online using Credit or Debit Card via Jammu & Kashmir Bank online portal. Permit Fees can be paid online using all major Credit/Debit cards and Net Banking of all major banks. On successful payment processing, a receipt will be generated, each transaction will be identified by unique identifier known as Collection ID. The payer is required to take printouts of Permit Receipt and Easy Collect Transaction Receipt. SMS and Email will be sent to Payer confirming receipt of payment. However, you have to visit the Leh DC Office or Tourist Information Center for verification of your permits and get them stamped. So, if you do not want to pay online, then visit the Leh DC office or Leh TIC office and pay the permit fee while getting the verification done for your permits. You can use the reference number to reprint your permit from the Homepage menu options again. You cannot apply online for Hanle permits and Pangong Tso to Tso Moriri direct route. Either you have to follow the manual process defined below and apply for those permits in person at Leh DC office. Or you can also take these printouts to Leh DC office and they will be able to put Hanle permit stamp on these online permits too. Pro Travel Tip: Apply for Ladakh Inner Line Permits online when your date is finalized. As the process now is online, the photo ID card number gets stored in the database and same proof cannot be used for next 15 days to get the permits. So, if you change the permit date after applying, you need to use a different ID for it else system will not allow it. The entire inner liner permit area is divided into 8 regions and you have to select the desired ones very carefully. Better get the region information first and then apply for it. If you are planning to apply for these permits in person or offline, then you can apply them at Tourist Information Center (TIC) Office, Opposite J&K Bank, Main Market, Leh or you can also apply for Inner Line Permits at Leh DC Office. The TIC office is open on all working days (Monday to Saturday) 09:00 AM to 07.00 PM. The timing of the Leh DC office is 10.00 AM to 5.00 PM (as told to us by the clerk there but not confirmed as I didn’t say it written) but they generally do not accept applications after 3 PM I guess. So, you should reach Leh DC office before 2 PM. Best will be to reach at around 10.15 AM to find the least rush and much hassle-free process. Is Leh DC office open on Saturday and Sunday? Leh DC office is closed on Sundays and other national Holidays. Hence, you should plan your Leh Ladakh trip such that your Leh local sightseeing day does not start with Sunday or a holiday. Having said that, I have heard that DC office is sometimes open on Sunday for half day as well but I will say don’t count on it. If that is the case, best it to apply the Ladakh inner line permits online or get the arranged in advance through some travel agent. Below are some steps that you can follow for applying Ladakh Inner Line Permits in person at DC office in Leh. You need to fill the permit application form to get the approval for your inner line permits. So, carry a pen with you, if filling directly in Leh DC office. The permits cost you Rs 300 for environment fee, Rs 20 per day per person for the permit. There is a fee of Rs 100 which is charged per tourist one time towards the Red Cross Fund. There is a special fee for the students, which is one time only of Rs 20. You need to show/attach the i-card I think with the permit copy. You need to have photocopies of a valid nationality Photo-ID proof (Passport, Driving License, Aadhar, Voters ID, PAN card etc.) which proves your identity. 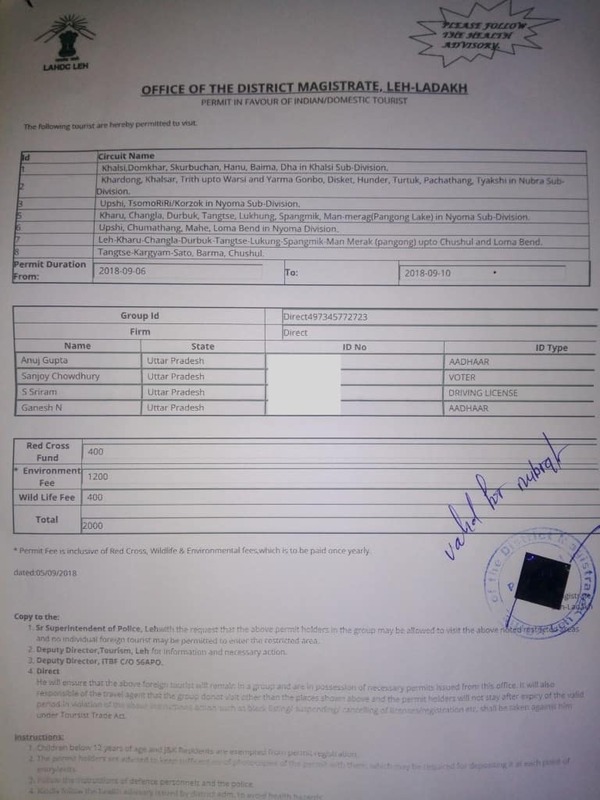 Although the photocopies were not checked for attestation for us, I feel one should not take any chance with it and get them attested before venturing to Leh Ladakh. You can apply the permits for your entire group but you need to attach the photocopy of photo-id cards (nationality proof) for each member in the group and make sure to fill the required details of all group members in the permit application form. Anyone who has yours or your group’s photocopies of valid Photo-IDs, he/she can get the inner line permits on your behalf as well. Usually, the hotels in the Leh town does provide this facility if you are OK with sharing the photocopies of your nationality proof’s Photo-IDs with them either via email or fax. The permit approval process may take anywhere from 30 minutes to 3 hours. Hence it’s always nice that you reach early morning at the Leh DC office. Sometimes, when there is a rush of tourists, the permits are issued in two batches viz. morning and evening. Hence, try to be in for early morning batch so that you have some time to partially head towards one of the destinations of your plan or do it at ease and consider Leh local sightseeing as a side option for the day. The application forms required to apply for the inner line permits are mostly available at the Photostat shops nearby (one is just behind Leh DC office). 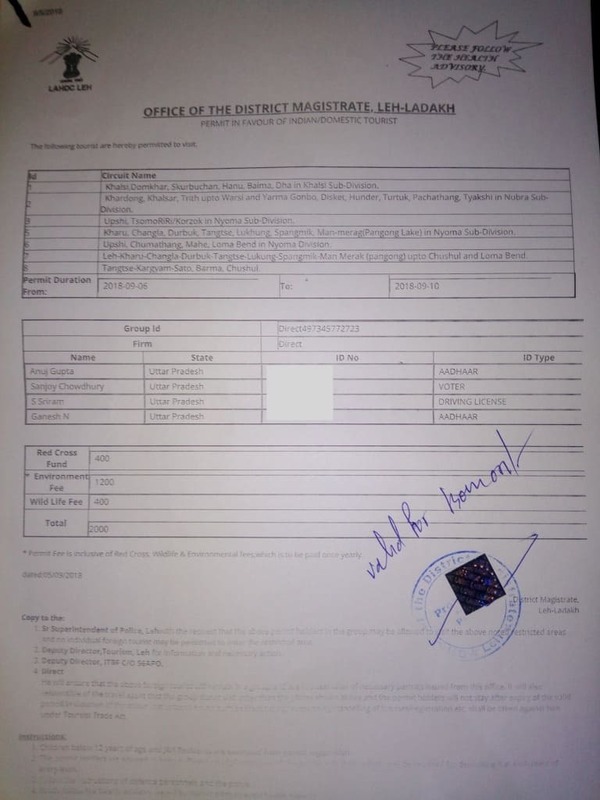 You can also download the inner line permit application form for Leh – Ladakh from the following download link as well: Inner Line Permit Form and Application Letter (Page 2). Usually, the form remains the same so filling the attached form at home and completing the documentation including required photocopies can save a lot of trouble running to-fro from Photostat shops. In the application form, for each member you need to mention the name with parent/guardian name, complete permanent address, the name of all the places you need to visit and the specific dates or date range for which you want these permits. At the last in copy information section, you may mention the hotel name plus address, you stayed or are staying in Leh. You need to write Nubra Valley, Pangong Tso, and Tso Moriri to cover all three major tourist spots in Ladakh. Writing Nubra Valley covers all the places in Nubra Valley including Khardung La and Turtuk. However, writing Turtuk as well will do no harm. Besides permit application form, you need to write a request application letter addressing DC of Leh – Ladakh district for the approval of your permits. In the inner line permit application, you need to express your interest in visiting the places you wish to travel along with the dates you would be visiting these places on your Leh – Ladakh trip. Both the application form and this request letter should be in sync with each other for places, names, and dates. You can download the unfilled request application from the following download link: Inner Line Permit Form and Application Letter (Page 3). Once, you are done filling the permit application form and writing the request application to accompany it, you make two-three photocopies of the entire set consisting Application Form, Approval Request Application Letter, Photo – IDs of all the members requesting for the permits. When the photocopies of the required set of documents are ready then you need to submit them at the DC office along with the original copies of the form and request application. The clerk will ask you to deposit the fees for required permits (amount will depend on the number of days and number of member in the group) + red cross fund fees (Rs 10 per member) + Environment Fess (Rs 400 per member). Once the fees are deposited, the clerk will put the stamp on the permits. In a few instances or special cases, the clerk may either ask you to get the signed approval from ADC room yourself or he/she will place your documents in the ongoing batch for further approval. Of course, in the latter case, you will need to wait for the approved permits to arrive which usually takes some time about 1-3 Hrs. Once, you get the stamped approved permits you need to again go back to the photostat shop to make photocopies of the approved permits. These photocopies of the approved permits are submitted at every check post that comes up on the way to your sightseeing destinations in Ladakh including Nubra Valley, Pangong Tso, and Tso Moriri. Hence, you should make at least 10 copies of them if you are staying long enough in this heaven. The validity of the inner line permits is 3 weeks for Indians and 1 week for foreigners. However, there is no limit on the number of times you enter a place in the valid period provided you have the permits with you for that place. Although not required, you may carry the passport size photographs as well. In fact, I believe, on all your trips you should carry the passport sized photographs with you as none knows when you need one. Did you check my comprehensive list of things to carry on a Ladakh trip? Yes, you can get the permit to travel to Hanle village by applying them at DC office in Leh. There will be an additional stamp that will be put on the permit copies that will authorize you to travel to Hanle beyond Loma check-post. Otherwise, the army will send you back from Loma check-post. In order to get the permits for Hanle and Changthang or to travel from Pangong Tso to Tso Moriri directly via Chusul – Tsaga – Loma – Nyoma route, you need to mention all the places on the route so that you are not sent back from any check-post. These places are Man – Merak – Chusul – Tsaga – Loma – Nyoma (for Pangong Tso to Tso Moriri) and Hanle (if plan to visit Hanle too). The permits for inner Changthang & Hanle are issued only to Indian Nationals, not for foreign tourists. Permits for Hanle & Chusul route are always issued subject to the present political or border situation. Sometimes, Leh DC office may not even issue the permits for Hanle and Chusul route. Even after getting the permits for Hanle and Chusul route with the extra stamp, do not consider it as 100% approval that you will be allowed to these places. Army guys have sent back many tourists since 2011 even having permits based on the actual political and border security situation. So, unless you pass Chusul check-post or Loma check-post to the other side, there is no guarantee that you will not be returned in between on these routes. One more thing that sometimes photography equipment is not allowed beyond Loma towards Hanle. So, in case you have cameras then please pack them in bags and refrain yourself from taking pictures on the route of sensitive areas in Ladakh. Best way to approach processing of Leh Ladakh Inner Line Permits is to first download the application form. Completely fill the form and attach the photocopies of the photo ID nationality proofs with it for all members of the group. Write a request application letter addressing Leh Ladakh DC expressing your intent to visit the desired places and request the issuing of inner line permits to you for the desired duration. If you are in a group you can write the names of all the members on the group and attach copies of their photo id nationality proofs. Staple the bundle including completely filled inner line permit application form, request application letter you will write for approval and the photocopies of photo id nationality proofs from home only. Then, once you reach Leh, go to Leh DC office and submit the bundle along with the required fees. Get the permit stamped from the Leh DC Office. In case of permits for Hanle and Chusul, make sure you get the required stamps for these places else you will be sent back by the army from the midway. On the way back to hotel or sightseeing ahead, get 8-10 photocopies of the permits issued to you. You need to submit these photocopies of the permits at the check posts while going to Nubra, Pangong Tso, Tso Moriri, Hanle etc. This will save a lot of time and energy for you in Leh. Otherwise, you will need to keep running up and down to photocopy shop for one thing or the other. Even to get the inner line permit form, you will need to go to the nearest photocopy shop and all this will surely kill time and exert you in Leh. Although highly unlikely, the worst case scenario would be that DC office changes the attached format of the inner line permit application form and refuse to take up the old version of it. 😥 Even in that case, you will just need to fill the new form and attach the documents with it before submission. I hope this article will help you get the required details on applying for the Inner Line Permits for Ladakh online as well as in person. As Ladakh Inner Line Permits are available online now, it will save a lot of hassles of moving around in Leh in first few days from one shop to another to DC office. You are also not required to worry about any holidays or odd timings of reaching Leh and then applying for the permits in person at Leh DC office. 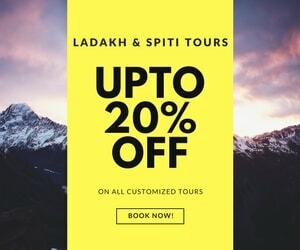 In case you find this article useful, feel free to share it with your family & friends who are looking out for a trip to Ladakh in this season. And if you have any further questions or doubts, in planning your trip to Leh Ladakh, please post them in the comments section of this article below. some of your articles and it’s pretty clever stuff. I just wanna ask you mate from where i can got the permit. I am a solo female traveler from Malaysia. Is it allowed to be in all those restricted area by myself alone without hiring any tour agency? Will this be approved by the goverment? Rina, you need to get the protected area permit through travel agency only being a foreigner but then you do not need to travel with them. It is just for the permits you need the agency. Thank you for the detailed guidance. Unfortunately, I had entered my name twice and try as I might, could not find a way to edit it. So I had to abort the attempt to get ILP online. I cannot even try again because my ID number is “already registered”. Any suggestions on what to do in such a scenario? I just want to know that will it be a problem?? Hi Dheeraj we’ll be visiting leh from 25 to 30 sep. And our route will be Leh to Nubra to Pangong to Leh. Which route I have to select while applying online for ILP. And after applying online would I still have to visit DC office?? Once you pay the fee and take the printout, visit the Tourist Info Center in Leh and get the permit stamped from them after showing the receipts. Is Pan card acceptable as ID for applying for ILP? Yes Rayhan, you can submit PAN card as it is a valid Photo ID Nationality proof. Hello Dheeraj, this forum has helped me a lot when I was planning my Ladakh trip. I got probably two friends for life and awesome travel partners from this forum itself. I am very much thankful. But, I am a freelancer and I write and take pictures for a living. Most of the pictures clicked by me are copyright protected. The cover photo that you are using is clicked by me. I uploaded it when I posted my query for travel partners. I would appreciate if you can credit it to me. My name is Tania Banerjee. Thanks. Has been duly noted and added as well Tania. The picture was used from DoW Media Library only as there was no description, we override the description. However, we have duly added your credit. Thank you very much! Much appreciated. Also, thanks for the awesome information you provide here. Keep up the good work! Rahul the article has the link to updated information. Suman, you will have to apply it manually by filling up form available at photostat shop near LEh DC office and then submit that form in person by writing Marsimik La on top of it with other destinations. Many of the sensitive areas like Marsimik La, Umling La, Hanle, Chusul route have been closed this year. Some are permanent closed, some they are issuing permits on off basis and in some case even after permits, checkposts at these places are not allowing to pass through. 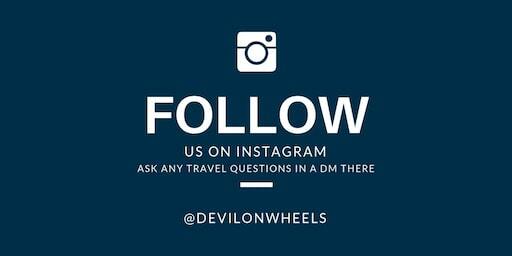 From your experience of traveling in Ladakh, can you advise on road conditions and the possibility of snow on the roads and snowfall while traveling to Leh from Shrinagar and Leh to Manali. It will help us to prepare ourselves better for the trip. We are planning the trip in last week of May 2018 from Delhi via Shrinagar route and aim to complete the circuit through Manali. Harsh, last week of May this year sounds reasonable to travel from Srinagar to Ladakh to Manali. Manali Leh road should open by the first week of June when you will reach that leg of the tour after covering Srinagar – Leh and Manali – Leh. So, I believe it should be fine to travel Regarding snowfall, it may or may not happen, it depends on the weather. Sometimes, especially on Manali – Leh, snowfall does happen in May or June. Hope you are doing well. I have two questions regarding the permit. Me and my friend are planning to cover Umlingla Pass near Hanle, and we have requested one of our friend in Leh to arrange the permits and mail it to us as we don’t want to go Leh and waste two more days. Do you think this will work ? or we have to be physically present in Leh to obtain the permits ? Second question is which all places should be mentioned on the permit to ride through Hanle region easily ? a) If we go to Nubra, can we come back on same day 21st, or shud we go to Deskit only and then return to Leh. iii. Return leh on 23rd by evening, hand over the bikes to lessor. iv. head to kargil via bus on 24th mrng so that we can reach srinagar by 25th..
Our return Flight is from Srinagar on 26th Aug 2017 at 1600 Hrs (Dept. tym) Need to be airport by 1400 Hrs and heard that travel time from leh – Srinagar is almost 12-14 Hrs and a night Hault at Kargil. Can we manage to reach srinagar airport on 26th before 1400Hrs if we leave on 25th Mrng. Vishal, I will recommend that you go to Nubra and stay for one night there and then next morning move to Pangong Tso directly from Nubra Valley. Then come back to Leh from Pangong Tso. This is the most recommended option or else drop Srinagar plan for sightseeing. Leh – Srinagar is around 13-16 Hrs depending on breaks nd traffic. Thank u so much for ur quick response and guidance. I really appreciate it..
We will travel Ladakh with a local experienced driver in his Xylo. Do we need to obtain inner Line permit / pay tax for him also? No, locals do not need permits. 1. What is the difference between obtaining Inner Line Permit directly and through agent? 2. I will visit restricted places on the first 6 days of Leh visit. After this, I will be at Leh for 3 more days for visiting Lamayuru / local sight seeing etc. What should be time span for my Inner Line Permit? 2. Go for the 6 days when you will visit restricted areas. We are Indian citizen, resides at Kolkata and have planned to visit Ladakh hiring local taxi and experienced driver. Time is first week of September, and the route is Manali to Leh. Return by flight. 1. Do we need to have Inner Line Permit to visit places like Khardungla, Nubra, Pangong, Tsomoriri & Hanle? 2. What is the procedure of getting the same – it will be great help if you can tell us the updated procedure of 2017. 3. Can we get it from my home town through mail/website link, or I need to visit Leh Administration office physically for this? 4. We are a team of 2 persons. Do we need 2 separate Permit or 1 single permit will be OK for both of us. 5. What is the cost for the permit? Permits require if we travel from srinagar to leh manali on personal bike or car? No permit required in this case for Rohtang Pass and on this route. However, if you want to visit places like Nubra Valley, Pangong Tso and Tso Moriri, you will need to get inner line permits. Thank you for such an informative guide for travelers. We are two couples, who have planned a bike trip around Leh from July 21- 28. It is the very first time for us in Leh Ladakh and also first time for long bike rides. We fall in the age group 30-35 and are physically fit without any serious ailments. Despite thorough planning with help of DOW, I am a bit apprehensive about certain aspects of the trip. The itinerary we plan to follow is given below: We are flying into Leh from Delhi. Day 3: Leh to Nubra via Khardungla. Overnight at Hunder. 1. What is the best route from Nubra to Pangong for normal bikes and will we have enough fuel to last Leh – Nubra-Pangong- Leh if we carry extra fuel with us? 2. We have Day 6 and 7 in hand and were wondering if Leh -Tso Moriri- Leh would be possible or too tight? I will recommend taking the traditional route from Leh to Changla to Pangong Tso rather taking the direct route to Pangong tso from Nubra which is quite tough and there is no help available in case of any breakdown. Since, you will be on rented bike, chances of breakdown is fair. 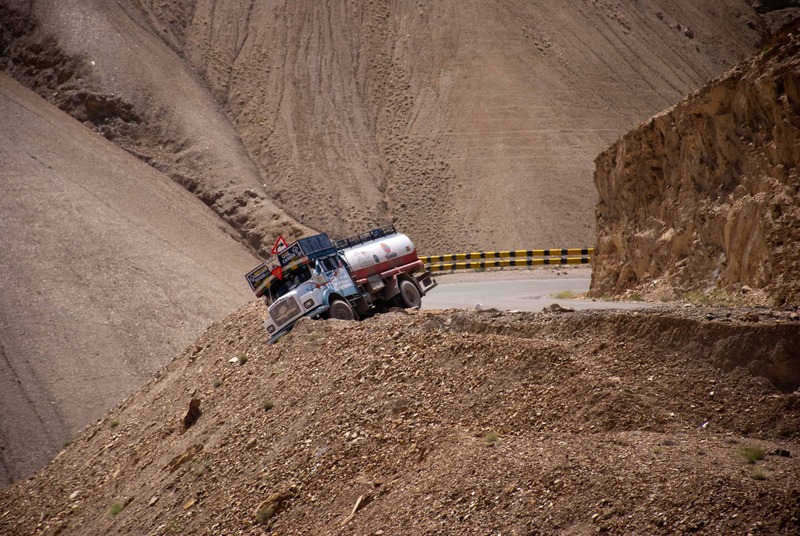 This will mean dropping the Tso Moriri and either use day as rest or do a three day trip to Nubra Valley and visit Turtuk village in Nubra Valley. Is any permit needed for going to Tso Moriri from Tso Kar lake? 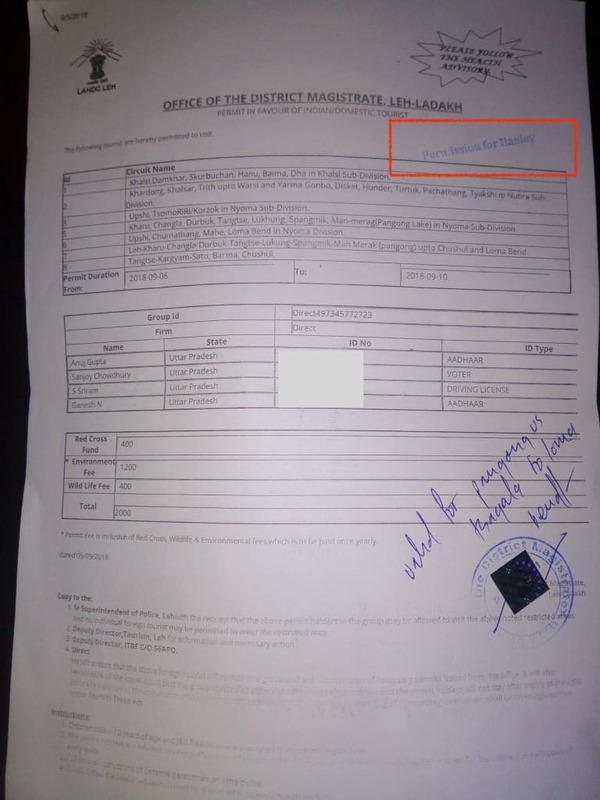 We are planning to go there in our way from Manali to Leh, so we can’t apply for any permit before because, as far as I uderstood, they can only be issued in Leh. Maybe the permit for Tso Moriri only applies for the route from Pangong? So, could we just go to Tsokar Lake instead? I undestand that no permit is needed for that, right? BTW we are riding Manali motorbikes. Are they allowed there? We know that they are banned in Tso Moriri, but not sure if this also happens in Tso Kar. Technically, they should not be taken to Tso Kar but you can always say that you are just moving to Manali – Leh and took a short detour in worst case if at all confronted. Probability is very very less. Spend a night at Chandratal after coming back from Kaza instead of Batal. It will prep you for a sleep at Sarchu. 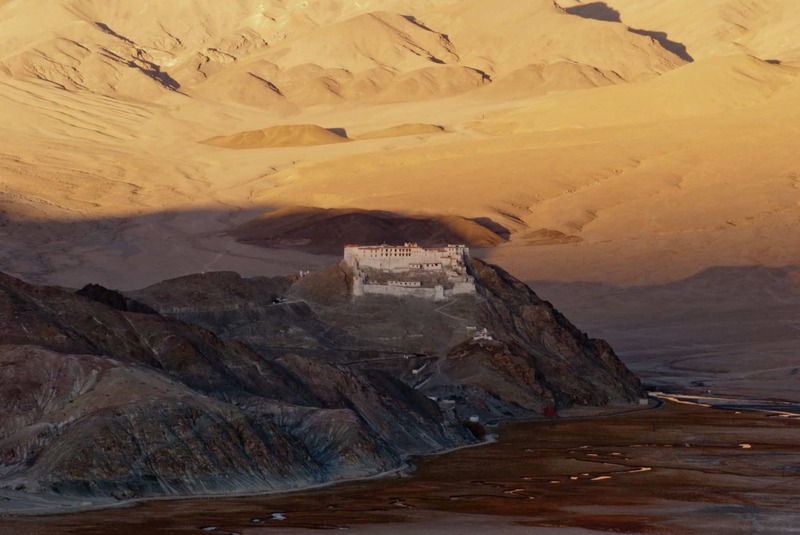 If you sleep well at Sarchu, there will not be any issue with Tso Kar as well. I have applied for inner line permits online but for payment there was not any options available. After I applying online for permit where should we have to pay environment charges and all. Do I still have to go to office of District Magistrate. Yes Amol, payment need to be done at DC office in Leh or at Tourist Info Center at Leh and getting the permits stamped.